Argentine singer-songwriter Cecilia Zabala and Brazilian jazz pianist Philippe Baden Powell have their Music of the Americas debut on January 26 in an exploration of their latest duo project, which fuses Zabala’s folk-inspired songwriting with Powell’s música popular brasileira sensibility. "O amor nao ve desordens" by Philippe Baden Powell & Cecilia Zabala from Fronteras. On February 3, Brazilian-Italian violinist Emmanuele Baldini, who for over a decade has been concertmaster of the Orquestra Sinfônica do Estado de São Paulo, joins forces with pianist Roberto Turrin in "Americas," which features works by Aaron Copland, Alberto Ginastera, Heitor Villa-Lobos, and Toronto-based Polish composer Norbert Palej. Glauco Velásquez's Sonata no. 2 at Festival de Inverno de Campos do Jordão. On February 13, just in time for Valentine's Day, reigning “Queen of Haitian Song” Emeline Michel—a captivating performer, versatile vocalist, and one of the premier Haitian songwriters of her generation—has her Americas Society debut. Michel's most recent album, Quintessence, captures the reverence and gratitude for the present moment, showcasing her virtuoso vocals in Creole, French, and English with vibrant instrumental backing. Emeline Michel, "Timoun" (dir. Abdias Laguerre, Cheval de Feu Production). Cuban early music group Conjunto de Música Antigua Ars Longa de La Habana performs their New York debut on February 26 with a program that draws on their 2013 CD “Gulumbá gulumbé. Resonancias de África en el Nuevo Mundo,” which highlights the African presence in Baroque music from the New World. The program, based on research by Guatemalan musicologist Omar Morales Abril, includes several villancicos negros, musical pieces intended primarily for Christmas, as well as poetry, recited by members of the ensemble. Presented as part of Music Before 1800 at Corpus Christi Church. On March 2, Mexican jazz singer Magos Herrera, one of the 2016–2017 curators at Brooklyn's National Sawdust, assembles an all-star cast of musicians, including Venezuelan pianist Edward Simon’s trio (with Adam Cruz, drums, and Matt Brewer, bass) alongside Argentine musician Pedro Aznar, in tribute to Argentine singer-songwriter Mercedes Sosa, known as "The Voice of Latin America." These musicians revisit some of Sosa’s most beloved hits, which spearheaded the rise of the nueva canción (new song) movement in Latin America in the 1960s and 1970s. Magos & Limón perform De Qué Callada Manera with Chabuco. 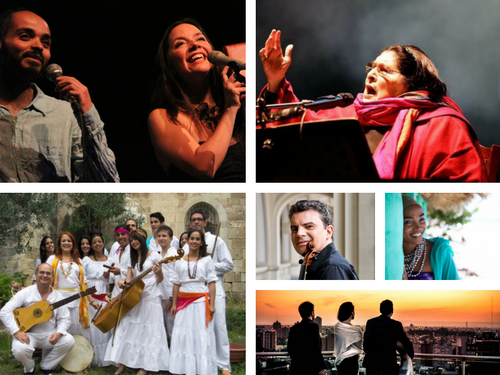 The New Docta Festival was cofounded in 2013 by Argentine musicians Solange and Sami Merdinian with French cellist Yves Dharamraj to bring classical music to their hometown of Córdoba. Their March 7 performance at Americas Society spotlights their work in Argentina, featuring all three cofounders, along with pianist Philip Edward Fisher. From Ginastera's two Pampeanas and Danzas Argentinas op. 2 arranged for piano trio, to songs by Carlos Guastavino and new compositions by Carlos Franzetti, New Docta presents an in-depth look at Argentine classical music. Highlights from the 2015 New Docta Festival.